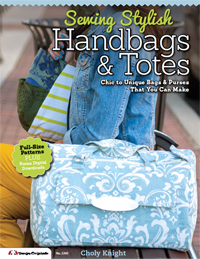 Sewing Stylish Handbags & Totes was published in June 2013 and is my third book. Being a bit of a bagophile myself, I was very excited to take on this project, creating 18 interesting and varied bag designs for every taste. I personally am the type that likes useful bags, but my goal in creating this book was to create bags for every need and every person, and to make classic favorites with an unexpected twist. Project info: Projects are illustrated through numerous full-color photographs explaining every step. 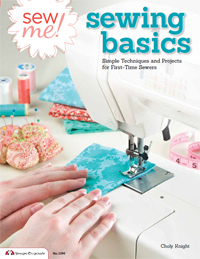 Also, the getting started section features how-tos on using several kinds of handbag hardware. Pattern info: Main project patterns are printed on full-size sheets found in the back of the book. 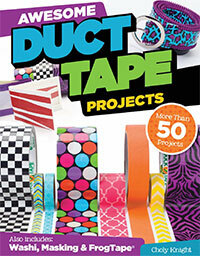 They are overlapped and printed double-sided, so tracing is necessary if you wish to use all the patterns. However, the lines are color-coded making them very easy to trace. Additional motifs can be found inside the book for enlarging at home or your local copy shop. 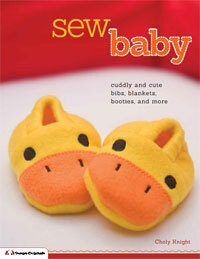 See my own tutorial on enlarging book patterns if you need more help! In my book, I’ve tried to satisfy lots of different tastes, and I’ve broken the projects down into three chapters. 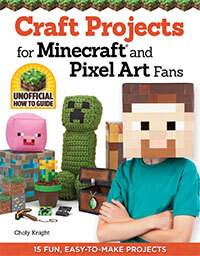 First is the chapter on Useful Bags. This includes a Collapsible Shopping Tote, with a perfect added feature of an attached zippered wallet that you can use to fold up the entire bag for when you need it! There’s also a very modern-looking Laptop Bag, which is nearly my favorite in the chapter. It’s sleek, minimal, and comes with some very techie templates for fabric painting. There is a super-handy Lunch Bag and also a set of Duffel Bags for making your own luggage. From left to right: Art & Craft Totes, Patchwork Purses with Side Pockets, Simple Shoulder Bags. With just a bit of resizing you can make a set of 3 duffel bags that fit perfectly within one another for easy storage. For quicker trips there’s also the Mod Weekender Bag, which has a classic Mod shape and comes with retro-looking templates for fabric painting. 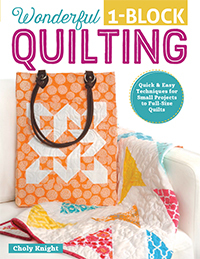 But perhaps my favorite in the chapter is the Art & Craft Tote. It’s a portfolio style tote with loads of pockets for people who do every kind of art and craft imaginable. 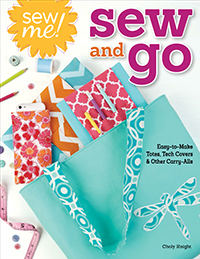 Let it be known that while this book includes 18 patterns (with even more variation options), it also has a huge getting started section that demystifies a lot of the hardware that goes into pricier bags, such as zippers, buckles, metal rings, turn-lock closures, strap adjusters, eyelets, the list goes on! And there are sidebars that explain how to add lots of awesome motifs to your bag by sewing on appliqué or painting your bag with fabric paint and freezer paper stencils. With additional lessons in creating pockets, straps, and other fundamental bag components, you might find yourself customizing the patterns to exactly your needs. From left to right: Hatbox Purses, Styled Shoulder Bags, Sling Bags. The next chapter covers Casual Bags. Here I’ve taken a lot of the classic and casual bags you might be used to. There’s a Simple Shoulder Bag that’s perfect for whipping up in an afternoon, and is specially designed to be made from recycled materials like fused grocery bags! Also a cute Patchwork Purse that looks great made from leftover bits of fabric. The Sling Bag is minimal on the outside, but packs a huge punch on the inside with tons of pockets that are perfect for a day of hiking! But perhaps my favorite bag in this chapter is the Expandable Messenger Bag. While it’s a simple design, it’s taken to a new level with an expandable bottom section that opens up your bag to nearly twice the original size! From left to right: Reversible Creature Bags, Pleated Evening Bags, Drawstring Bags. 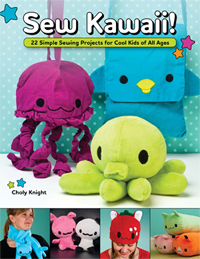 Lastly there’s a chapter of Quirky Bags, which are perfect for kids or those with a quirky sense of humor. These might remind you of some of the kawaii accessories you’d see at Modcloth or Thinkgeek, and they include a practical Drawstring Bag that can be done up like a squid, or a Monster Bag that’s completely reversible! There’s also a classic Crossbody Purse with a cute pocket detail that I couldn’t help but dress up with some cute characters. Also there’s a sweet Roundabout Purse and Hatbox Purse. But perhaps my favorite for the chapter, and maybe even the whole book, is the Embellished Satchel. This bag has loads of details including a leather laced strap, old-world-looking fabric paint templates, and lots of hardware. It was made for all those people who are inspired by long mountain adventures or even just writing poetry by the riverside. From left to right: Embellished Satchels, Crossbody Bags, Roundabout Purses. As with all the projects, of course, these elaborate or cutesy embellishments are all completely optional, so if you find them too outlandish for your taste, I do hope you’ll consider the bare bones patterns to be just as classic and adhering to more mature sensibilities. The book comes with two sheets of full-size preprinted patterns that overlap each other, so if you plan to make many of the bags, you’ll want to trace them off of the master sheet with some tracing paper. Luckily a roll of tracing paper is much cheaper than visiting your local copy shop to make enlargements from the book. 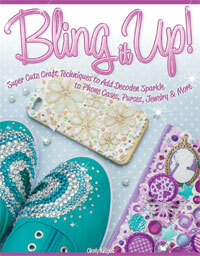 I am making the Roundabout Purse in this book. It calls for a 20 inch zipper, but the top pieces that are supposed to be sewn on either side of the zipper are only 14 1/4 inches long. I don’t understand. Is there a misprint or something that I don’t understand about the directions? The extra length was mostly for insurance, but I see what you mean about it being too much. It was probably a misprint so I’ll be sure to look into making the correction when the book is reprinted! I just wanted to make sure I wasn’t doing something wrong. So the zipper should really be the same length as the top pieces??? If so, I’ll bar tack the zipper and shorten it. Just wanted to tell you I’m making the purse out of a camo fabric that is digital looking, and I’ve appliqued your Ninja kitty in brown on one side. It’s for my daughter for Christmas. She is an animated cartoons and film buff, so I think she will love it. I would like to share some pictures with you of my finished purse. How can I do that on this site? I think the best you can do on this site is offer up a link to the photo — but if you wanted to post it on my Facebook or email me, that would work too! I figured out how to send it to your Facebook page. I ‘m enjoying your Hand bag and totes bag book. I’m sewing duffle bag and can not figure out the pocket. It is square preety much and has two notches cut out. I am assuming they are to help with depth of the pockets. Do I put the two notches together and sew? It is the 6b pattern pieces. 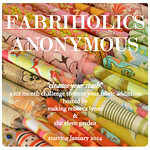 I ‘m looking forward to making many of your bags they are so much fun!! Oh good! I’m so glad you’re liking it! But yes, you’re right about the pocket — the notches are there to create some depth to it. On page 58 of the book it shows how to fold those edges together to create the depth for the pocket. A similar pocket shows up on one of my free patterns here, the Zippered iPad Case (step 4), if another view helps. I hope that helps you work it out! If the pocket gives you any other trouble, I’ll be happy to explain more or draw up a quick diagram or take a quick picture if I can. Just let me know! Thanks for your quick reply. I let you know if I need more help! Should their be two from the middle notch and then one on each end that you are making the 45 degress angles? I think I might have this figured out. ok I need your help I can not figure out the two cut outs notches and on the end. Any help you can give me would be great. I will work on a different section. Thanks so much! You picture was great for the zippered ipod case I just can’t get the angle right . Sorry about the delayed reply! I was taking some photos of the whole process in the hopes that it would explain things much better for you! 1. Here’s the back side of your pocket piece (6B). You can only see one half right now, but hopefully you get the idea that the whole thing is there. The RED lines are your hem folding lines. The BLUE lines are your seam lines, and the GREEN lines are the areas where the pocket will fold when the thing is all done (don’t worry about these until the end). 2. Pay attention to the RED lines for this step. We’re going to fold the fabric along all the RED lines to get something like this. The previous BLUE seam lines haven’t changed. 3. Next, pay attention to the BLUE lines at the corners. To sew the outer corners on the left and right, this is where you fold the fabric at 45 degrees. You’ll want to pinch it like you see me doing here in an attempt to bring together the two “legs” of the BLUE seam lines. 4. This is what it should look like when you’ve brought the two blue lines together. The fabric should be folded at a diagonal in just that corner. 5. Now sew the fabric layers together along the blue line. Since both lines are matched up, you should be sewing through both at once. 6. When the corner is finished, it should look something like this from the back. 7. And something like this from the front. 8. Now we’re going to do the same thing with the inner notches of the pocket. The inner notch is made up of two seams that are like the corner notch except they’re connected in the middle. Just focus on one side and pinch the fabric at a diagonal like before. 9. Bring together the blue lines just like with the corner notch. If you focus on just the one side, you’ll see it’s just like the corner. 10. Now repeat the same thing with the other side, and you’ll find the blue lines form one straight line as you see here! 11. With the blue lines all straightened up, you’ll want to sew across that entire line. 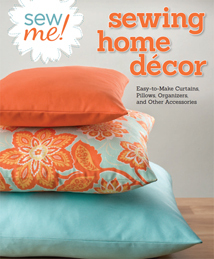 This sews both corners at once! 12. Here’s what it’ll look like when finished from the back side. 13. And from the front side. You can see how the pocket is starting to form. Those soft folds you see on the sides are where the GREEN lines from before lay. Now you can finish the pocket as it mentions in the rest of the book. Hem the top, add the Velcro, and attach it to your bag! You are awesome ! You did so much work on this, Thank you Thank you. My favorite bag is a shoulder bag with two outside pockets one on each side- 1 for sunglasses and 1 for the readers I unfortunatly need now. I also like an outside zipped pocket for each access to keys; several inside pockets are also great for small things that might otherwise fall to the bottom. I bought your book (handbags & totes) online from Amazon and I think it is a great book, easy to follow, and tracing the patterns is not a problem, however, the envelope in the back of the book contains 2 sheets of the same patterns. I did not realize this at first because the purses I made, I had the pattern on the first sheet but now I want to make the briefcase and then I discovered I had 2 identical sheets. The briefcase calls for pattern 18C,D and E. But the sheets I have only have patterns for 1,2,3,4,6,10 and 11. 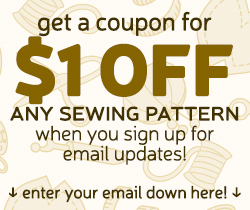 I hope you can help me and send me the second sheet of patterns. Oh no! I’m so sorry that happened! I’ve actually been there before once, with a Vogue pattern I bought a long while back (and I couldn’t buy a replacement because it was out of print) x_x not fun. Wow, your book is so great. I’m going to start with the pirate kitty (picked up some awesome orange wool fabric at the thrift store), then, let’s see, probably the messenger with the gamer controller, hmmmm, I will be busy. You’ve really sparked my imagination. Love all the bags. Thanks for a great book! I admire your talents & creativity, & do like the cute & clever bags in your book. However I do have a problem with the presentation. I’m usually good with instructions, but sometimes it seems the pictures don’t match up with the instruction. There also seem to be gaps in the details. The biggest concern is with how the patterns are done. It is a real hassle with them all overlapping & on the front & back of the same page. I spent a couple hours just tracing out some pieces from the first sheet; now I’m too pooped to start anything. I had been really excited to get something started, but can’t now. I don’t want to be negative, but wonder if some ‘beginners’ might have quite a bit of difficulty figuring things out. I do really like the variety you have, & they really are cute, so I will keep the book, but my enthusiasm has gone away for today! I still wish you best of wishes with your work, tho. Blessings! P.S. I’ve tried to send this reply several times & it has cut off & I don’t know if it went to you or not, so apologize if you have received several from me or from someone ‘unknown’! Hello! I’m so sorry the traceable patterns and instructions gave you trouble! You’re definitely not the only one While the decision to make the patterns like that was to save space, it’s something we hope to improve upon in future books. Thank you for all the kind words and support, though! Your suggestions are a huge help! Sawing a handbags give use a chance to choose material and design. But for busy women it’s really hard to do It. You have nice blog to read.. Thank You..
On page 43 of the book It says Digital Patterns Available . 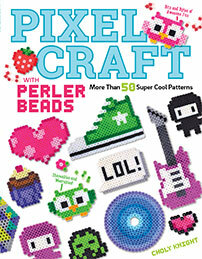 I tried this and it brings you to the publishers page but the book or the digital patterns are not listed. Where can I get them. It’s a lot easier for me to do things digitally. But in the meantime I’ve emailed you something that might help! Yeah, unfortunately the publisher doesn’t seem be supporting the link anymore. I do have a digital version of the Laptop bag, which is what I believe the original download was for. So I’d be happy to send that to you if that would help! Hmmm, not sure why I received these 2 responses since I had not sent the questions! No problem; just letting you know. That is weird I’m not seeing any reason why that happened on my end. Sorry about that! The book is amazing!!! The instructions are very clear and easy to follow and the photos complete all the way to make a cute bag. I have just one “problem”. I would like to do some projects in a different size. With your online patterns I could print the pdf in a minor scale but I can’t manage the physical patterns, is there any way to find the patterns in pdf? I bought a digital copy of your book and I LOVE IT but… there are no patterns to download. 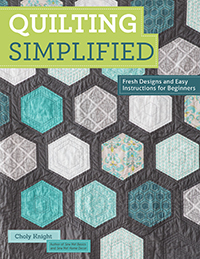 Did I just buy a book for the patterns and now I have none which ya know is a serious problem or am I missing something ? Thanks so much for buying a copy of the book! I honestly didn’t know that digital versions were available for it! It does come with a pattern envelope that has most of the pattern pieces printed, so I’m not sure how they converted that into a digital format. So unless they sent you multiple files, I don’t think you’re missing anything. My best guess would be to contact your seller about it, since that is definitely not something they can skip! I bought the book and I’ve looked just about everywhere in it but it doesn’t seem to include approximate finished product sizes. Is there anyway I can get the finished sizes? Thanks. Hi, Choly! I bought the Kindle edition of “Sewing Stylish Handbags & Totes” and there’s only ONE link to a pattern, the Laptop or Tablet Bag. I followed the link to Fox Chapel Books, and got that pattern. But there aren’t any other links in the Kindle edition. I’m baffled! Help! I solved the problem by returning the Kindle book and buying a copy of the paperback! I’m excited to make myself an awesome new backpack!